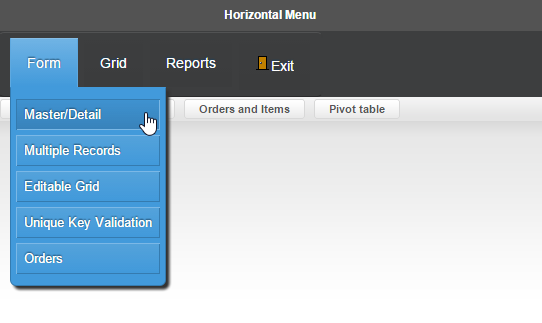 This example demonstrates how to create a horizontal menu. 1. Create a new menu application. 2. 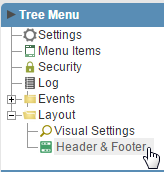 Click in Menu Items to define the hierarchical structure of the menu. For a hierarchical menu add items and sub items. 3. Add the main items. 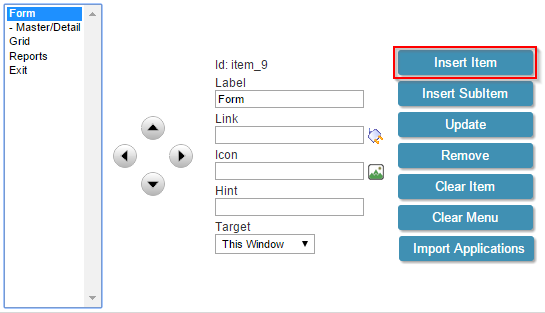 Enter Form in the item Label and click in Insert Item. 4. 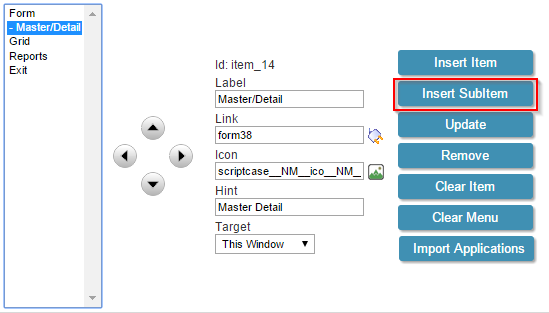 Repeat step 4 to add the items Grid and Reports. 5. Add an item with an option to close the application. 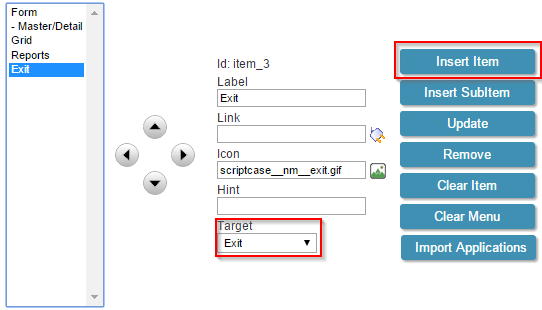 Enter Exit in Label, in the Target choose Exit and click in Insert Item. 6. 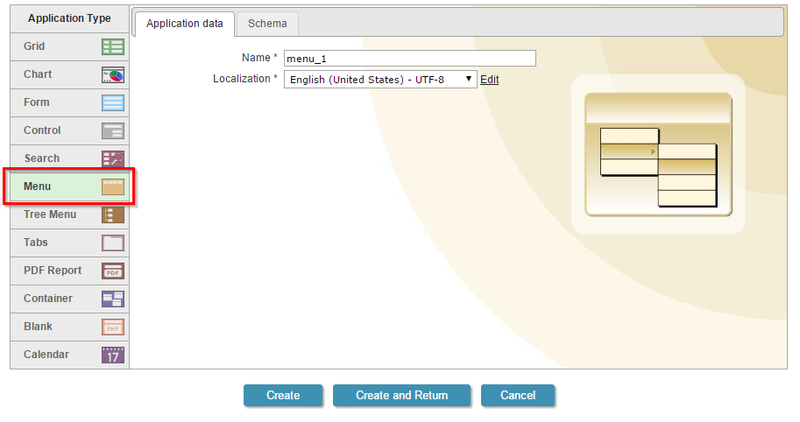 To create a sub item it is necessary to select the item and then click in Insert SubItem. 7. Create a sub item on Form. 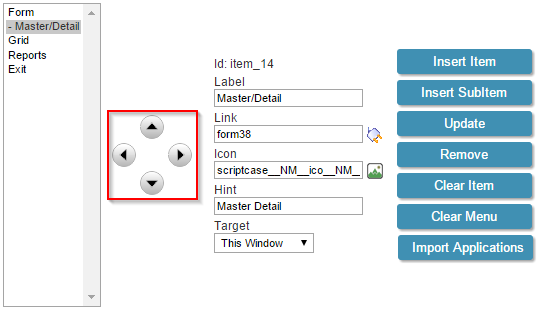 Enter all required data (Label, link, icon, hint and target). See the image below. 8. Look the item Master/Detail. It is positioned one level inside of Form. 9. Once the menu is completed it is possible to change the items positions and levels using the directional buttons. 10. Use the table below (with items and sub items used in this sample) to create a menu. The steps are the same described before. 11. Open the folder Layout on the menu and click in Header. 12. Check the option Yes in Display Header.